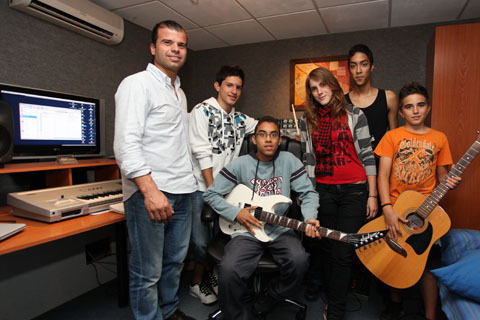 The winners of the Marbepop 2010 competition are in the recording studio. Steel Day, who won Marbepop 2010 back in August, visited the Fhersound recording studio in Marbella and recorded three songs. As well as the CD, Steel Day also picked up a cheque for €1400. Also in the studio were second placed band The Inks, who won €700 in the competition. The Marbella Town Hall Youth Department has made 600 copies of the CD, which will be available later in the year. The Youth Department's Diego Lopez commented "This CD is the result of hard work by the bands, and its a reward for all their efforts. They will now be able to present their songs to record companies and agents in a professional way"
the best band i saw in a long time!!!! dont stop!!! you never know where you can go!! I LOVE IT!! I SAW THE SHOW IN MARBELLA AND THEY ARE GREATTT!! I REALLY LOVE IT!! STEEL DAY WE WANT MORE SHOWS!!! !